The iPad mini is available in white with silver or black with slate black, much like the iPhone 5. In determining what size to make the iPad mini’s screen, Schiller said, Apple engineers worked to make the device smaller, but not “so small that it stops being incredibly useful.” The iPad mini screen measures 7.9 inches diagonally. Like the iPad 2, the iPad mini employs a 1024-by-768 resolution, meaning all existing iPad apps work with the iPad mini, too. Schiller said that the iPad mini is great for the same tasks that the full-size iPad is good for: games, Facebook, Web browsing, email, GarageBand, iWork, and so on. “I could sit here and list 275,000 examples” of what the iPad mini is good for, Schiller said, referring to the number of iPad-optimized apps in the App Store. 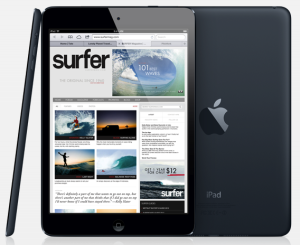 Compared to Android tablets, Schiller said, the iPad mini is vastly superior. Apps are custom-built for the iPad, but on Android tablets, apps are often blown-up phone apps that aren’t optimized for the device. Inside the iPad mini, Schiller said, “the technologies...are equal to or better than the iPad 2.” The iPad mini uses Apple’s dual-core A5 chip. It has a FaceTime HD front-facing camera and a 5 megapixel iSight camera on the back. It gets the same LTE capabilities as the fourth-generation iPad with LTE, and faster Wi-Fi, too. Of course, it uses the Lightning connector. Apple says that, like the other iPads in the lineup, it still offers ten hours of battery life; the company boasts that the iPad mini uses the largest and thinnest battery Apple’s ever made. Apple also introduced a lineup of new Smart Covers for the iPad mini. The polyurethane Smart Covers custom-designed for the iPad mini are available in pink, green, blue, light gray, dark gray and (Product) red for $39. Existing Smart Covers and Smart Cases work with the fourth-generation iPad. Among the new Lightning accessories Apple unveiled on Tuesday are cables for connecting cameras and SD cards. Schiller also took the wraps off the new fourth-generation iPad, saying, “It’s amazing.” The new iPad uses the Apple A6X chip, a new chip that further improves upon the speed performance of the A6; the company claims that it’s twice as fast as the A5X, with double the graphics performance. It gets the same ten hours of battery life as the third-generation iPad. New to the fourth-generation iPad is a FaceTime HD front-facing camera and a Lightning port that replaces the 30-pin dock connector of old. And the Wi-Fi is twice as fast as in the previous generation. Pre-orders for the fourth-generation iPad will follow the same schedule as the iPad mini, starting this Friday. Updated at 2:30 p.m. ET with information on Smart Covers, Lightning accessories, and images of the new iPad.